The recent holiday really turned out to be a holiday from the kitchen, too. I'd managed to outsource my catering so well I could barely function upon returning to normal life. "What the hell is this? Is this really supposed to take this long? Why the hell would anybody start food blogging?" There are some holidays posts in the works still (scenes from the beautiful Finnish archipelago at least!) but in the meanwhile (as I'm trying to get back to grips with everything that is supposed to go on in a food blogging household) let's start with the publishing queue. With this quick and easy two-ingredient tapa. Much like chorizo braised in cider this is as simple as tapas can get. 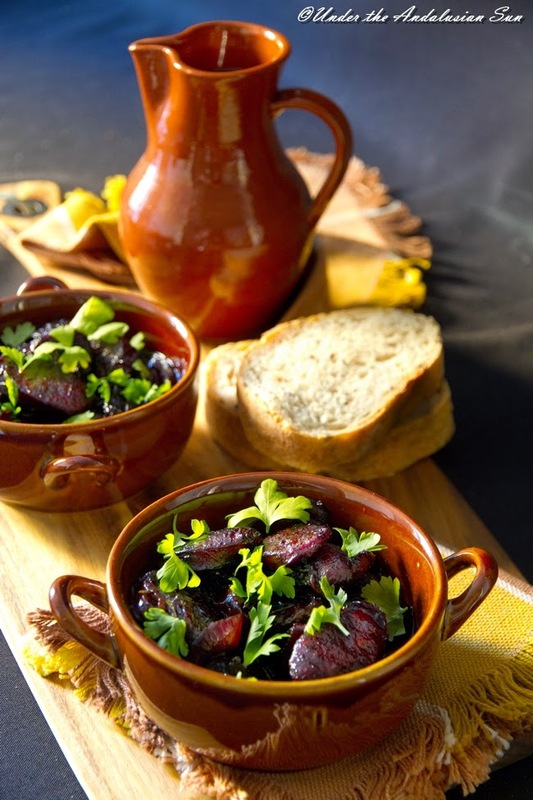 At its simplest the recipes only call for two ingredients: chorizo and red wine. Two ingredients I happen to like muchas. 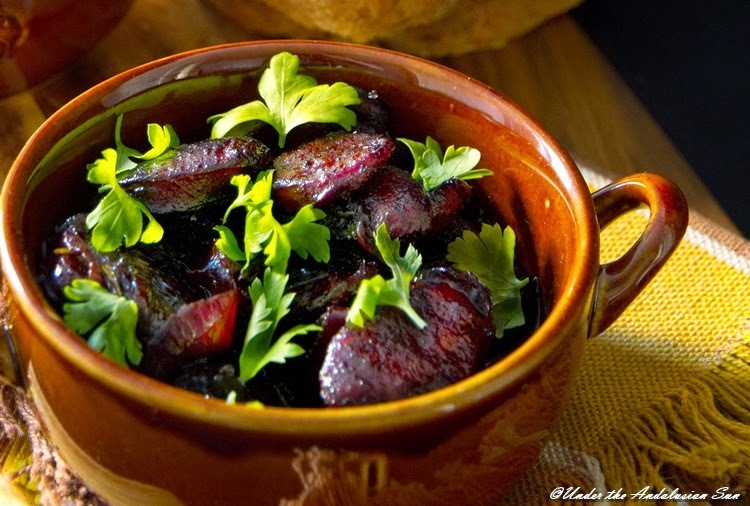 But this is a recipe that's proved a hit even among those who normally don't care for red wine. Keep the really sturdy stuff for something else though - for this recipe the best wine is on a lighter side, such as Garnacha or a light Tempranillo. Heat the oil over medium heat in a pan. Add chorizo, cut to about 1 cm slices, into the pan and brown until they start rendering their delicious fat. Then add finely sliced red onion, rosemary, bay leaves and red wine. bring the heat down and cook until most of the liquid has evaporated - about 20 minutes. Check taste, season with black pepper if needed, sprinkle the parsley over top and serve with good, crusty bread. Prick the sausages and place in a small pan/ pot (one with coating, no oil needed). Pour wine and rest of the ingredients over the top. Crank the heat up and let simmer quietly (uncovered) for about 20 minutes. Remove from heat and let the chorizo cool in the liquid. Then cut it into slices, brown and pour over the wine. Keep cooking until most of the liquid has reduced. And for more tapas ideas - look here!